Review: I'm talking wow! The new Awia CSD-TD69 CD/Cassette Boombox by Awia, will soon be the talk of the neighborhood. This small, lightweight boombox has got everything you could ever want out of a boombox. 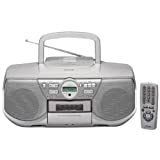 We're talking a radio with digital-synthesizers to keep your radio stations from tuning in and out, and check this out, this little boombox can preset up to thirty of your favorite radio stations. No more searching for your favorite radio stations. It's also a CD player equipped with CD-R/CD-RW playback and CD repeat. The graphic equalizer (jazz,rock,pop) delivers a high-quality acoustic sound. Not only is it a radio and CD player, but a casstte player too. It comes fully equipped with a tape counter, full-logic casstte performance and a headphone jack, for those who want to listen by themselves. The graphic synthesizers work with cassettes too. So you can listen to your music with jazz added or however you want. The Awia boombox has got outstanding speakers as well. Their reflex cabinet creates enough enclosure space for both the left and right speakers, providing you with equal amounts of music coming out of both speakers, meanwhile, the cylindrical port lets the speaker move more air out, thus increasing the bass response. Equipped with the Super T-Bass, Awia, accentuates music at low frequencies, creating even more of a pronounced bass sound. It is incredible! When I first listened to it, I couldn't believe what I was hearing! It was fabulous! Now for those of you who fall asleep and leave your stereo on, Awia can go off when you want it to. I'll tell you, this boombox has got it all. It comes with a sleep timer that can be set for 5 minutes up to 120 minutes. You just say when, by setting the sleep timer, and Awia goes off at the designated time. You can still fall asleep listening to what you enjoy, and not have to wake up finding out you left the stereo on again. When I say Awia puts the "boom" in boombox, I'm not kidding. It even comes with a remote control, so you don't have to get up to adjust the volume or change stations or anything. One thing I felt was a drawback in this boombox is that for so much power and sound for a little box like the CS-TSD69, I would have thought Awia would make it large enough to accomodate more than one CD at a time. Even though you do have a remote control, you still have to get up and change the CD. You can't push a button and have the boombox switch CDs.